IBC 2017 in Amsterdam has started and Comprimato cannot miss this important event. This time we were invited to the Net Insight booth 1.B40 and we are very thankful for this opportunity to Net Insight. Comprimato is very excited to demonstrate the live demo of the new software video transcoder as a part of Net Insight Nimbra setup. 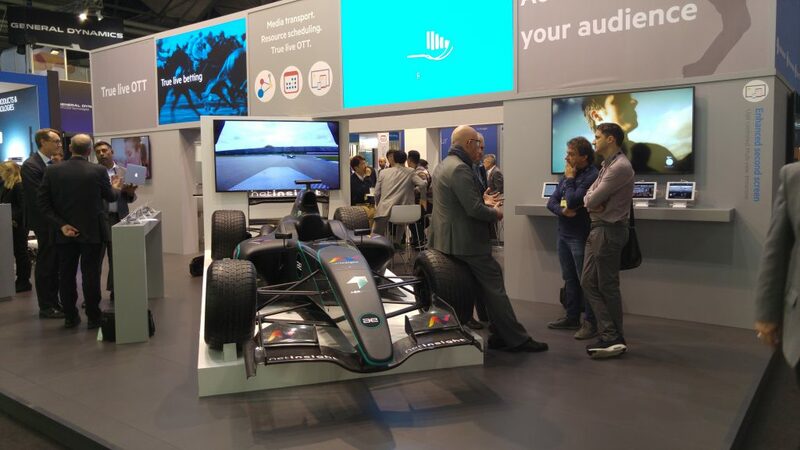 If you are broadcaster dealing with live events and plan to add more streams or just looking for a replacement of the old-fashioned and expensive encoders and decoders, come to see us at booth 1.B40 (I am pretty sure you stop by anyway because of the awesome booth set up with the real Formula 1 car). We also invite all who are looking for a world’s fastest JPEG2000 encoding/decoding solutions, which Comprimato still offers and improve. Have you seen the demo already and want to have a reminder? Below is the visual part of it with a workflow description. The signal is coming from the RAW (uncompressed) feed to the Net Insight Nimbra, it’s wrapped into JPEG2000 IP and send over TR-01 to the Comprimato live transcoder which produces MPEG-4 in this case. Folks from Net Insight can give you all the details regarding Nimbra setup and, image quality, bitrate and other important aspects. The second stand demonstrates cloud broadcasting and streaming using Netinsight infrastructure with Comprimato Live transcoder, this time from California to Amsterdam. We believe this is the future, software way, how broadcasters can deliver a new type of services to the end-users. If you want to try it now, simply contact us for the free-trial of the Comprimato video transcoder for live events.